I’m often asked about how I feel about accent walls and wall treatments. Should people use them or not? Yes! I am a fan of accents & wall treatments. I actually have an entire board on Pinterest dedicated to wall treatments. Of course, how they are applied and interpreted in a design is very important to the overall success of a room. Whether its paint, wallpaper or that you upholster your walls, wall treatments can be a beautiful way to take your room’s design to the next level. 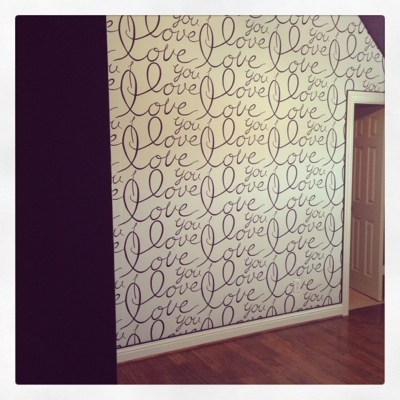 Here are a few ways we’ve used wall treatments in our designs. 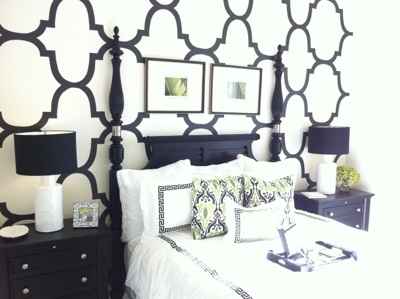 Master Bedroom: Large scale pattern painted on the wall behind the bed to create a focal point. Kid’s bedroom: We took the dot pattern we used on the bed skirt & bedding & blew up the scale to create a fun feature wall behind the bed. 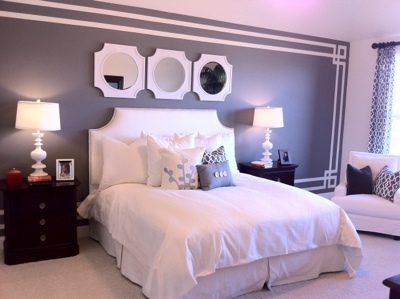 Master bedroom: To create contrast behind the white upholstered bed, we painted the wall a deep gray. Then, we painted a fretwork outline to define the wall. Kid’s room in progress: We upholstered the bed wall in a super cute embroidered “I love you” fabric in navy & white and painted the rest of the walls in Benjamin Moore’s Symphony Blue. I can’t wait to see the finished room! Do you have a Pinterest account? If not, you should consider getting one! 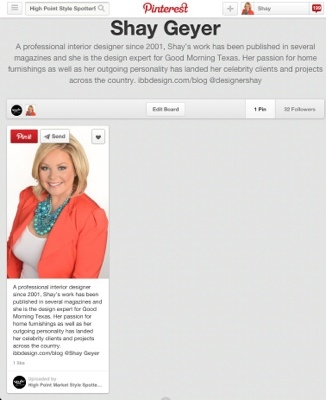 It’s a fabulous tool to use for inspiration & stay on top of trends & what’s hot in design. I also love it for great recipes, fashion, crafts & so much more! Speaking of trends, make sure you also follow my board for the High Point Home Furnishings Fall 2013 Style Spotter contest. From October 17th – 24th I’ll be pinning my top 25 favorite finds from market along with eight other of the country’s top designers. Find out more here..